Hi all! Welcome to Retro Reads, where I talk about my favorite books that were published at least ten years ago. You can still find most of them online, though sometimes they have been re-released with a different cover and/or title. I will let you know if a book is out of print and/or otherwise unavailable. Yesterday, I noticed that some neighbors a few houses down have llamas in their front yard. Being that I live in the city part of Atlanta, I was a bit taken aback; wildlife of that magnitude isn’t usually seen around here (although the Mennonite church a few blocks down has sheep, which are available for rent to chew up rogue shrubbery, but I digress). Seeing the llamas reminded me of Dark Paradise, the first Tami Hoag novel I ever read. The novel is set in Montana and tells the story of Marilee Jennings, a court reporter in California who takes a leave of absence from her job to pay a much-needed visit to her friend Lucy. Lucy was a fellow court reporter who came into a mysterious inheritance and ditched her job to live in Montana a year prior. When Marilee (“Mari”) arrives on Lucy’s doorstep, she finds Lucy’s expensive-looking house ransacked and learns the news of Lucy’s allegedly accidental death–and that Lucy left everything to her, including the llamas in the spacious backyard. Mari soon figures out that Lucy’s death wasn’t an accident and someone took the fall for it. Her quest to bring the true killer to justice almost gets her put in a grave next to Lucy–even as she fends off the pressure from John “JD” Rafferty, the attractive owner of the neighboring ranch who wants her to sell Lucy’s land to him, to further his own agenda. Dark Paradise has the right balance of suspense and romance; indeed, the character development is as enjoyable as the plot–which doesn’t have a stereotypical “happily ever after” ending. . What I like best about the characters are their flaws; Hoag makes them truly human, questionable decisions and all. The plot is an interesting commentary on gentrification and how it is furthered in areas considered playgrounds for the wealthy, and the ripple effect on long-term area citizens. This book was written back in 1994, before gentrification became so prevalent here in America, yet the message still resonates today. 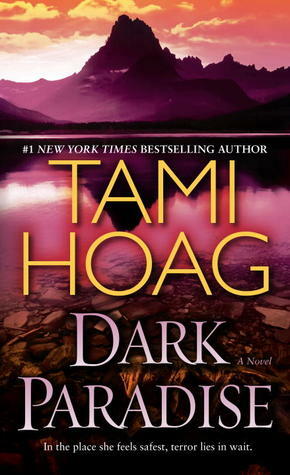 I’ve gone on to read and enjoy other books written by Hoag, but Dark Paradise remains my favorite. It’s an engaging read that is worth the trip.